Accelerating investments pertaining to the adoption of sustainable energy technologies coupled with favourable regulatory framework toward the upgradation and expansion of grid network will stimulate pumped hydro storage market. In 2016 the UN, reported an investment of USD 45 billion for strengthening & modernization of ageing grid infrastructure worldwide. In addition, upsurge in power consumption across the emerging economies along with increasing concerns toward energy security will positively influence the product adoption. Grid stability, energy efficiency and large-scale storage capacity are few features which will foster the pumped hydro storage market. In addition, the ability to black start coupled with ongoing PHS capacity expansion will positively influence the product demand. For Instance, the FERC has allotted 50 preliminary permits for energy storage expansion across the U.S.
Utilizing advanced technology for expansion and upgradation of ageing plants to improve the operational flexibility will augment the market. Increasing investments toward developing sustainable storage technologies coupled with ongoing energy efficiency norms will further enhance the business outlook. International Finance Corporation in 2017, declared a funding of worth USD 1.20 billion toward clean energy sector in India. 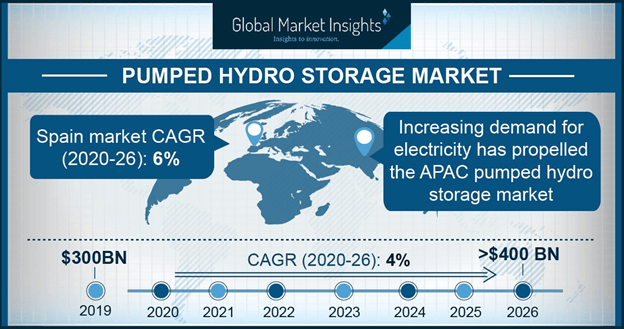 Ongoing innovations and research & development activities including variable speed technology coupled with network frequency control will complement the pumped hydro storage market. However, ecological constraints including disturbance & damage to the aquatic ecosystem and habitat loss near the site of installation might hinder the business growth. 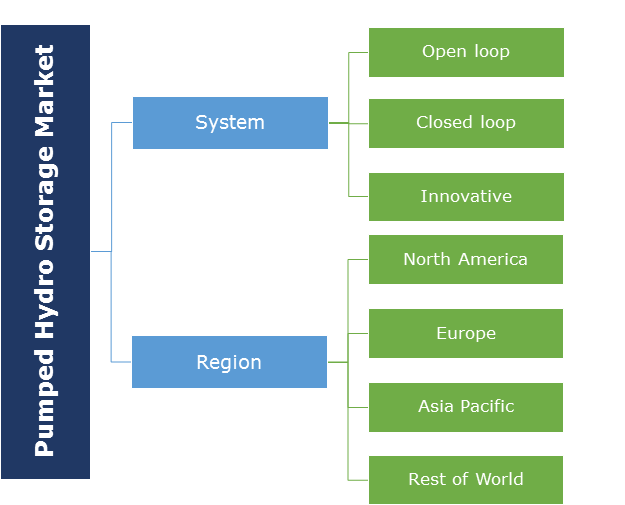 Open loop pumped hydro storage market size will grow on account of relatively lower capital requirement associated with its construction along with low cost of refilling the upper reservoir. In addition, compatibility with a hydroelectric power plant coupled with availability of natural source of water will positively impact the industry growth. However, strict environment regulations along with rigorous licensing parameters by FERC and other regulatory authorities may impede the business growth. Closed-loop PH system is predicted to surpass USD 12 billion by 2024. Stringent environment regulation along with low impact on marine habitat will boost the industry growth. In addition, ongoing innovations across generators and turbine designs will fuel the pumped hydro storage market. In 2017, the Department of Energy, mentioned eighteen projects of closed-loop PH system which are in under construction or planning stage across the globe. Upgradation and restoration of ageing grid network coupled with rising demand for reliable and uninterrupted power supply will augment the U.S. PHS projects. Advanced distributed generation technologies along with the development of microgrid network will boost pumped hydro storage market. For instance, in 2017, Saudi Arabia invested USD 40 billion toward the infrastructure development across the nation. Germany pumped hydro storage market size will grow over 1% by 2024. Favourable energy efficiency compliance programs along with growing demand for sustainable energy storage technologies to meet the increasing power demand will encourage the product adoption. For instance, the European Commission announced a directive 2012/27/EU, across the European member states for creation of regulated framework for promotion of energy efficiency. Increasing adoption sustainable energy sources coupled with rising concerns toward security of supply will stimulate the South Korea pumped hydro storage market share. Growing demand for energy storage along with upsurge in power consumption will boost the industry growth. Major industry players including Enel, Alstom and Voith have marked their presence owing to significant research and development activities across the nation. China pumped hydro storage market capacity will surpass 46 GW by 2024. Increasing need for grid stabilization along with exponential rise in power consumption will propel the industry growth. Stringent government regulations pertaining to carbon emission coupled with renewable energy technology integration will encourage the product demand. The National Energy Administration announced an investment of USD 361 billion to develop flexible grid network and integration of renewable energy generation technologies by 2020. Key industry players catering across the pumped hydro storage market include Alstom, Voith, EDF, Absaroka, J-Power, Eskom, Genex, Toshiba, Snowdonia, Dongfang Electric, SinoHydro, Northland Power, Eskom, Schluchseewerk AG and, Enel. Increasing investments toward developing low cost storage systems coupled with advanced technological installations are the key strategic measures adopted by the major industry players. Furthermore, capital budgeting along with achievement of economy of scale in long run are few measures adopted by business players for business expansion. Pumped hydro storage plants are used to meet the peak load energy requirements and load stabilization of the grid. The storage systems consist of two water reservoirs located at different elevations. During peak demand times the water stored in the upper reservoir is utilized to run the turbines to generate the electricity. While at low demand times generally at night when the price of electricity is low, the electricity from the grid is utilized to pump water back up, restoring the upper reservoir. The system manages the excess generation capacity, support the integration of renewables along with efficient and reliable functioning of the grid.